3-D Printer Uses Metal To Make Custom Rib Cage For Cancer Patient : Shots - Health News Doctors say it's the first time a titanium sternum and set of ribs have been made with a 3-D printer. The custom-made device has already been implanted in the chest of a cancer patient in Spain. Engineers made the implant with a metallic 3-D printer that melts titanium powder. At first glance, the metallic device almost looks like a high-tech bike pedal. Or maybe the latest cooking gadget for zesting lemons. Or, perhaps, it's a secret weapon for X-Men superhero Wolverine. 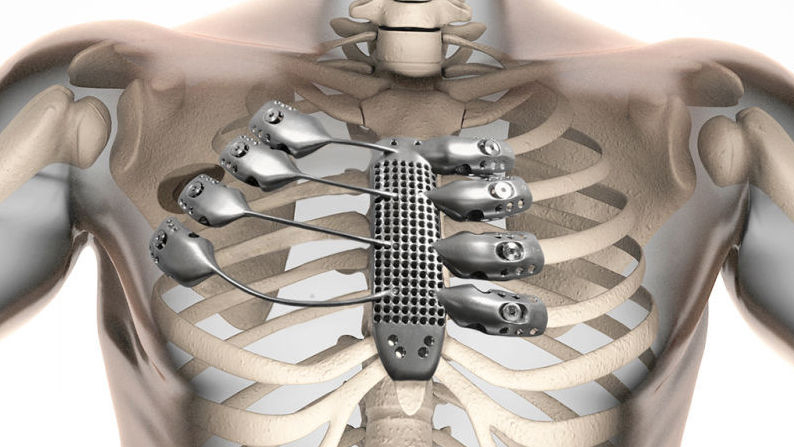 Doctors in Spain say this is the world's first 3-D-printed rib cage, made entirely from titanium. And they've already implanted the device into the chest of a 54-year-old cancer patient. The man lost his sternum and pieces of four ribs when doctors removed a large tumor. 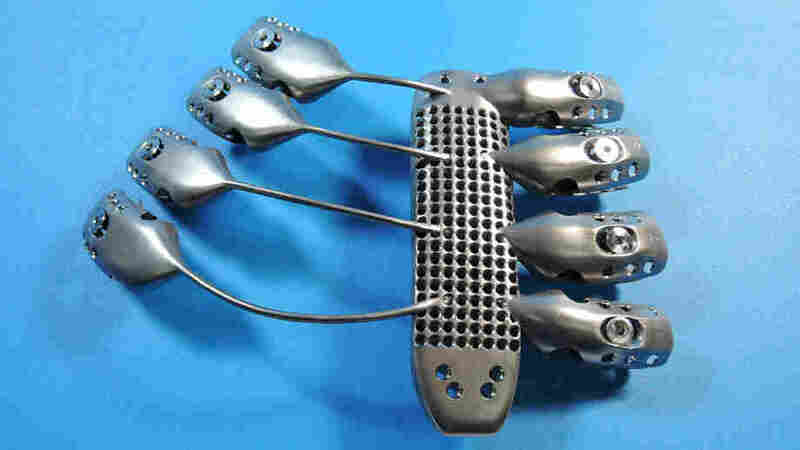 The perforated center section of the implant is the prosthetic sternum. Four thin rods on the left mimic ribs. They're thin and flexible so they can bend during breathing. The eight clamps on either side attach the implant to bone. Screws hold the clamps in place. Surgeons at Salamanca University Hospital reported the man's case — and how they made the prosthesis — last month in the European Journal of Cardio-Thoracic Surgery. Engineers at Anatomics in Melbourne, Australia, custom-designed the device using CT scans of the man's chest. They manufactured the implant with a $1.3 million metal printer at a government-run lab. The printer uses an electron beam to melt titanium powder, says engineer Alex Kingsbury, who helped make the titanium rib cage at the Commonwealth Scientific and Industrial Research Organisation. The printer then paints each layer of the device, one on top of another. "As each layer is fused, you start to build up a product," Kingsbury says in a video by CSIRO. "It would be an incredibly complex piece to manufacture traditionally, in fact, you know, almost impossible." CSIRO wouldn't say how much the artificial rib cage cost. "But for complex and customized implants, the cost [to print them] is more affordable and the time to produce it is shorter than with traditional manufacturing," Crystal Ladiges, a spokesperson for CSIROs wrote in an email to Shots. As metallic printers become more common, she wrote, so will 3-D printed implants. Surgeons typically use a combination of flat plates, bars and mesh to build an artificial rib cage and sternum for patients. The 3-D printing technology allowed the surgeons to create an implant that "fitted like glove" in the man's chest, Dr. Jose Aranda, of Salamanca University Hospital, said in a statement. He and his colleagues hope the better fit will mean fewer complications in the long run. But the surgical team admits that such a complex prosthesis is probably helpful only for extreme cases, when extensive reconstruction of the sternum and rib cage are needed.